Who are guilty of continuously heat styling their hair like me? I feel your pain. If you suffer from frizzy, dry and tangled hair like me, then do try hair serum. Basically, a hair serum help transform the hair. About 3 months before, I ordered John Frieda Frizz Ease Miraculous Recovery Repairing Crème Serum and here is my honest review. It is a repairing serum for dry, heat-damaged, frizzy hair. This cream serum visibly transforms dry, heat-damaged, frizzy hair and seals split ends. This product is intended for use on both dry and wet hair after shampoo and conditioning. When I used this product on towel dried hair, I found that only a dime-sized amount of serum worked great. 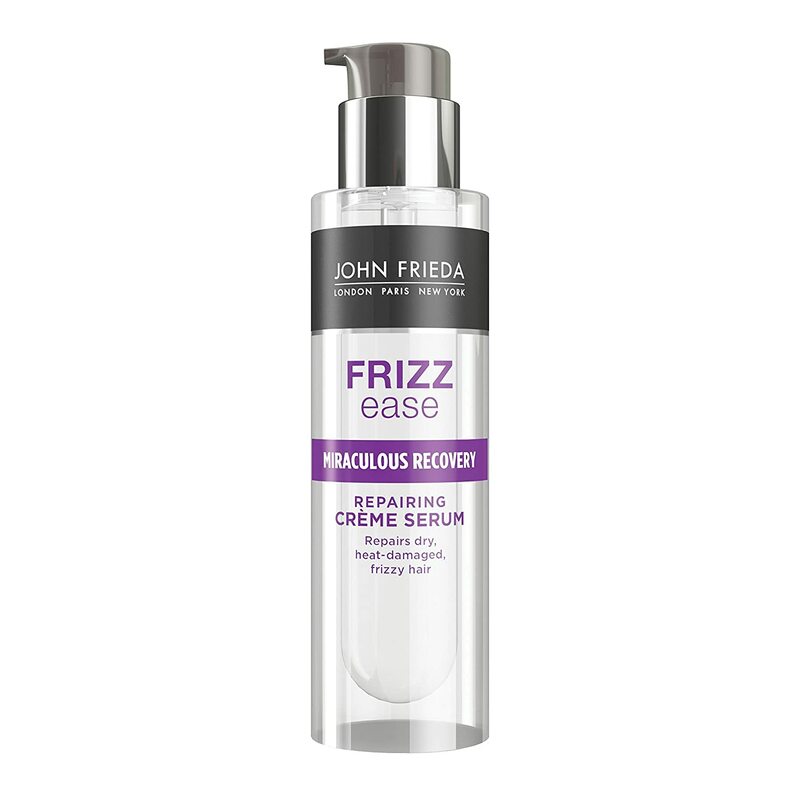 John Frieda Frizz Ease Miraculous Recovery Repairing Crème Serum kind of sealed moisture in my hair and added silkiness. So, the hair looked amazingly beautiful and let me tell you, I had never felt my hair this soft before! John Frieda Frizz Ease Miraculous Recovery Repairing Crème Serum did not impart any oil or grease-like residue on my hair. It instantly tamed frizz and hair were manageable. Hair becomes shiny and smells magical. With regular use, I found that the product helped seal split ends as well and protected from damage. The bottle is attractive and big, however, the contents are inside the inner bottle attached to pump. So, I felt small sized packaging would have been better especially for travelers. John Frieda Frizz Ease Miraculous Recovery Repairing Crème Serum is bit pricey but it is effective. John Frieda is the most recognizable beauty brand in the world. So, my hopes were high for this product. I am happy to say that I am not at all disappointed with my purchase. Overall, I loved this product and I do recommend it. John Frieda Frizz Ease Miraculous Recovery Repairing Crème Serum does what it says! This product works wonders for medium to coarse frizzy hair.